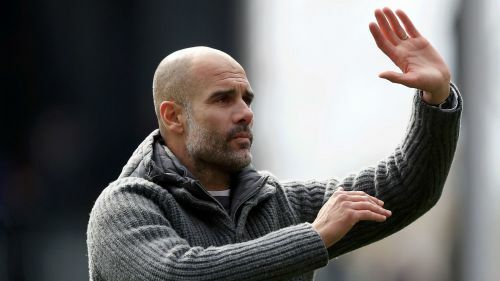 Pep Guardiola knows the next eight days will prove decisive in Manchester City's bid for a clean sweep of major honours this season. City host Tottenham in the second leg of their Champions League quarter-final at the Etihad Stadium on Wednesday, nursing a 1-0 deficit from last week's meeting in north London. The teams face each other once more in the Premier League on Saturday before next Wednesday's Manchester derby at Old Trafford – City's game in hand as they sit two points behind Liverpool at the Premier League summit. Talk of an unprecedented quadruple has mounted over recent weeks, with EFL Cup winners City also booking their place in May's FA Cup final. However, Guardiola recognised his best-laid plans could go up in smoke over the course of a pivotal week. Asked whether City were entering a decisive moment of their campaign, Guardiola told a pre-match news conference: "Definitely, yeah. "If we don't win these games we will be out in two competitions. Absolutely, they are finals for us. "I had this feeling from weeks ago." The relentless title race against Liverpool cuts a sharp contrast with this time last year, when City had already been confirmed as runaway Premier League champions. "We don't have 12 points [advantage] like last season. This season we have an incredible opponent in Liverpool. "They have 85 points, we have 83 with one more game left [in hand]. Both teams deserve to be champions, only one is going to get it." Guardiola is hopeful for a clean bill of health for Wednesday's Spurs encounter, except for left-back Oleksandr Zinchenko, who is still pushing for a return to training following a hamstring strain. Sergio Aguero had a first-half penalty saved during the first leg, when Guardiola's conservative tactical approach invited plenty of scrutiny. City's all-time leading goalscorer Aguero recently returned from a muscle injury and appeared to be struggling after being replaced during Sunday's 3-1 win at Crystal Palace. Although Guardiola knows optimum fitness might not be possible for Aguero on Wednesday, he rallied the Argentina striker and his team-mates by stating it would be an occasion for will and desire rather than perfection. "He is fit. Of course, Sergio needs competition – games and games and games," he said. "When he stops for one week or 10 days he needs a little more time to get his best condition. "But [Wednesday] is not about the physical condition. Either you want to get to the semi-finals or you don't want to get to the semi-finals. "That is the moment or that is not the moment. To say that is [down to] the physicality is ridiculous." Fernandinho sat out the trip to Selhurst Park but the influential holding midfielder is set to be in contention after training on Monday, albeit with "below medium intensity", according to Guardiola. Are Manchester United finished this season?